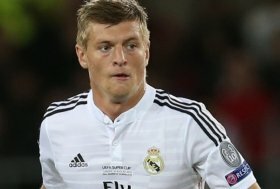 Kroos set for Real exit? Manchester United have received a boost in signing long-term target Toni Kroos with the midfielder keen on parting with Real Madrid in the summer. The German has made over 220 appearances for Los Blancos in the past four-and-a-half seasons where he has won three Champions League crowns and one La Liga title. Despite this, his form has been pretty average over the course of the current campaign and AS claims that the Germany international is eyeing a fresh challenge elsewhere. It is added that Los Blancos are not actively looking to sanction the player's sale but they won't come in the way of the midfielder, should he choose to end his association with the club. In this case, United are regarded as the front-runners to pursue him, though it is unclear whether the club will revive their long-term interest in the former World Cup winner. Kroos is said to be valued in upwards of £50m by Los Blancos.